Marie Beltrami is a creative, no doubt about that. Her apartment, on the ground floor of a hôtel particulier near the Invalides, decorated in an intensely personal way, is the standing proof of this unbounded creative energy: not one surface has not been customised to stick to the aesthetic ideals of this grande dame of fashion. The walls themselves become canvasses for her close friends (and even Sting, whose autograph can be spotted on picture 8! ), who decorate the typical Parisian walls with words of love and admiration. A former stylist for Jean-Paul Goude (remember Chanel’s Egoïste advert? She did the styling), the jewelry and accessories designer – you can spot her cute mouse rings on our beloved Please – has an incredible passion for creation, transforming a broken-down cardboard box into a tribal totem, or slipping an oversized metro ticket in a transparent vinyl handbag. Her clothes? Marie made them herself, no big deal (we particularly like her blue dress, inspired by the design of Gitane cigarette packets). She also made most of the colourful hats displayed all around the flat, as well as her incredible banana-studded mules. We love how Marie turns everyday objects into art pieces, following the surrealist concept of détournement, like her handbags on which are draped colourful pieces of underwear. 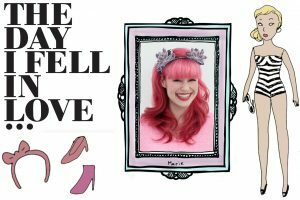 But our favourite accessory has to be Marie’s candy-hued hair, a bubble-gum quirk that particularly suits this witty coquette, who drops a million fashion anecdotes throughout our interview. Find all of Marie Beltrami’s creations here. Photography by Olivia da Costa, words by Fleur Burlet.